With its Pleasure Beach, Sea Life Centre, Grand family shows and more, in Blackpool with the kids, there’s one thing you certainly won’t be – Bored! Blackpool is renowned for having something for everyone. From the thrills of the white-knuckle rides at Blackpool Pleasure Beach, to the dazzling performances of Tower Circus, Blackpool has boundless activities that the whole family can enjoy. And exploring the best of Blackpool with the kids should be a treat, not a chore. So we’ll be covering some of the greatest attractions Blackpool has to offer – ones that cater to all kinds of tastes! The obvious choice is Blackpool Pleasure Beach. Founded in 1896 along the Fylde Coast, it’s inarguably one of the most visited parks on the globe. And providing for all ages with its exhilarating rides, famous seaside fair, an array of children’s attractions. It’s no wonder that this is Britain’s most iconic amusement park. Rollercoasters like the 85mph ‘Big Dipper’. The 65-metre-tall ‘Big One’. And the terrifying ‘Ghost Train’ will deliver thrill after thrill for those more daring families. Never mind the brand new ICON! Or for younger kids, Nickelodeon Land is packed full of childhood favourites, including ‘Wallace and Gromit’s Thrill-O-Matic’ and ‘her World Voyage’. And if you have something of a competitive streak, why not challenge the family at the arcades, bowling alley or crazy golf course while you’re there? Alternatively, for those kids aged 13-18, Blackpool Tower Dungeon offers thrills with some history to boot. Including a 60-minute tour packed with scares and laughs in equal measure, the Dungeon offers fully-themed experiences for anyone brave enough to delve into Lancashire’s spooky past. In Blackpool with the kids and looking to test yourself? With a harness in check, feel the G-Force as you jump between trees, swing above the sea, and face the thrilling ‘Skycoaster’ at the Adrenaline Zone. The Ascent Trampoline Park is also a fun, safe and action-packed way to keep fit and have fun all at once. Easily accessed if you’re at the heart of Blackpool. And Laser Quest is perfect if you’re after an action-packed and atmospheric sci-fi adventure for the entire family to enjoy. The Grand Theatre is the place to go if you’re in Blackpool with the kids. 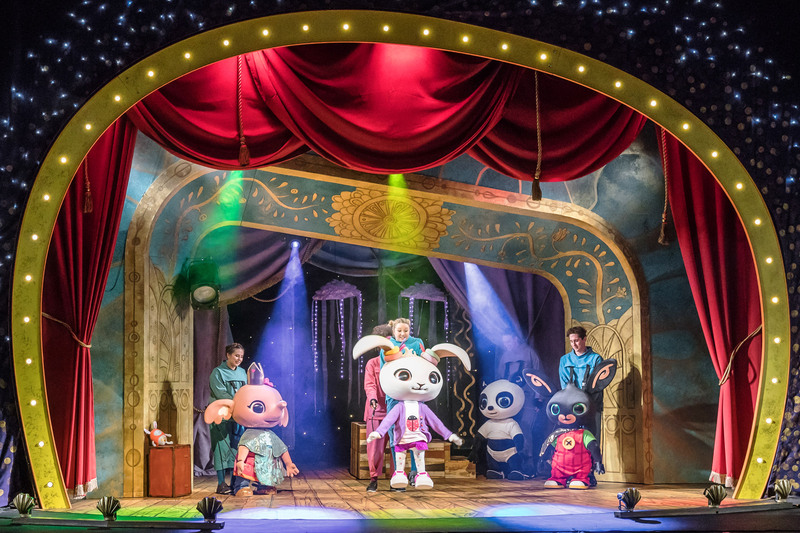 From iconic musicals to CVITV Favourites, and hilarious pantomimes, the Grand Theatre’s family shows offer a wealth of entertainment for even the most restless of youngsters. For families with a taste for the extravaganza, the Blackpool Tower Circus is bound to mystify and impress. Both children and adults can relish in the showstopping feats of the Circus’ talented performers. Take a look at Blackpool Family Shows For Your Diary. There’s everything from Chitty Chitty Bang Bang to hit children’s favourite Bing Live and the spectacular Panto! Grundy Art Gallery offers an eclectic exhibition ranging from historic to contemporary art. If you’re in Blackpool with the kids and after some culture in the arts, this is the place to visit. Blackpool Model Village and Gardens is another award-winning attraction, featuring hundreds of handcrafted models, figures and more. Depicting British life and culture with a little added humour! The Blackpool Tower Eye is a safe way to experience stunning views from the highest point of Blackpool Tower. At 380ft! On a clear day, you can even see all the way to the Isle of Man. Blackpool’s stunning Stanley Park with incredible Gardens and adventure activities as well as a beautiful Cafe in the Centre – perfect for that sit in the sun with an ice cream or full Afternoon Tea. Blackpool Zoo is perfect for anyone seeking insight into the lifestyles of a vast array of animals. Overseen by parkland experts, talks and animal feeds to deliver a hands-on experience for families who love wildlife and the outdoors. Picnic areas, restaurants and gift shops are also in high supply. Not only lions and tigers need to dig into a hearty meal. Or, for any ocean-fanatics out there, the Sea Life is an ideal attraction. Underwater tunnels let you witness the beauty of the ocean, safely surrounded by an array of graceful and unusual ocean-life, including the world’s largest Crab! The Shark Reef Encounter is one of the most popular attractions. Offering the chance to understand more about these misunderstood creatures with talks from experienced aquatics. If you’re perusing near the coast of Blackpool with the kids, then why not dive on in? Or ride along the coast on Blackpool beach’s famous donkey rides. Each sweet-natured donkey has their own name, and are guaranteed to be a hit among any animal-loving family. And all this has only scratched the surface of everything a day out in Blackpool with the kids has to offer. Fun, culture, good food and quality family time – Blackpool provide all. And not only in the obvious places. There are so many gems dotted around Blackpool if you’re after something a little less tourist-heavy. For more information on Things to do in Blackpool look no further! To book a show at Blackpool’s Grand Theatre (why wouldn’t you?) take a look at their What’s On and simply select the dates of your stay in Blackpool. Offering the very best in touring Comedy, Drama, Dance, Musicals and more. No stay can be complete without a show. Here are some recommendations on Things To Do In Blackpool or, Where To Eat In Blackpool we have some great ideas for you. Further accredited hotels can be found on VisitBlackpool website.